The islands off the coast of Papua New Guinea receive few visitors but a luxury cruiser now allows adventurers to explore. In this glassy stillness five degrees south of the doldrums, there’s no division between sky and ocean. The only visible feature is a local boat, which looks like a giant butterfly resting on the surface of the Solomon Sea. The insect’s wing is the single black sail; the spindly legs are the outrigger, which balances the main canoe. The boat — a style unique to the Dobu people, whose homelands extend from the Trobriand Islands south to the Louisiade Archipelago — holds just enough wind in its sail to make slow progress. Otherwise, there’s nothing to this place but the endless blues of a South Pacific wilderness. The boat is called Hopeless. Mine is less ill-named, and certainly better kitted out. 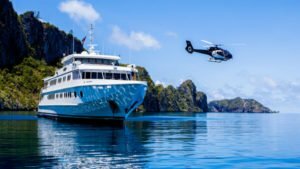 True North is a 36-berth luxury adventure cruiser loaded up with scuba gear, fishing tackle, fine wines and emu carpaccio. It carries six aluminium-hulled tenders, and has a six-seater Eurocopter EC130-B4 parked on deck. The 50-metre boat was designed and is run by its owner, Craig Howson, a likeable 52-year-old former crayfisherman from the west coast of Australia. The only vague sign of Howson’s self-made wealth — he started at 19 with a 15-metre fishing boat — is the South Sea pearl he wears, pirate-like, on a leather thong around his neck. Like Howson, True North is unpretentious. And just as people gravitate towards Howson’s good humour at the bar, so too does True North command an extraordinary word-of-mouth following. I’m one of only six of the 32 passengers on board who are True North virgins. One client is on his 11th trip; during our 10-night itinerary through the waters to the north and east of Papua New Guinea, six rebook for another expedition. It’s not cheap: the trip I’m on costs from A$17,295 (£8,780) a person, with any sightseeing excursions with the helicopter charged extra (as a guideline, five hours in the air costs A$3,160 per person). Accommodation is comfortably luxurious rather than over-the-top glitzy: crisp linens, immaculate bathrooms, large windows. There is 24/7 internet connection (slow but present), good food (barbecued crayfish, steak sandwiches, only the odd misconceived jus) and an engaging onboard marine biologist, Dr Andy Lewis, who is among the Solomon Sea’s most active coral reef ecologists, and leads True North’s snorkelling trips. Dive, fish, snorkel — it is the daily mantra on this boat, with its agile 2.4m draft (at one point the captain reverses into a tiny comma of a bay at Misima Island, to sling the bowline from a tree). This ability to navigate awkward waters, including shallow atolls and serpentine river systems, helps determine the boat’s adventurous 11-month circuit, sailing from March to September along Australia’s Kimberley coast, then into the Rowley Shoals, a group of three coral atolls 170 nautical miles west of Broome. Early in October, True North pushes towards Flores, then to West Papua for whale shark watching, before looping down over the top of New Guinea to explore the Sepik River. This is followed by a cruise through the islands of the Bismarck and Solomon Seas. 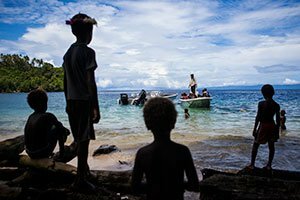 This is the trip I am doing — a cruise from Kavieng on New Ireland, south to Alotau, a 1,000-nautical mile journey during which we encounter not a single tourist. But then not many visitors get out to these Pacific islands. Ruth Sirambat, owner of the guesthouse on Tsoi-Lik Island, tells me she has logged 90 guests in the past 12 months. Schubert Kollen, a guesthouse owner on Fergusson Island, reports 103 visitors since 2008. These paltry figures can be ascribed in part to periodic unrest in Port Moresby, Papua New Guinea’s capital, as well as the difficulties of travelling the impenetrable topography in a country without a functioning road network, and bad domestic flight connections. True North, on the other hand, brings passengers in from Cairns to Madang, Kavieng or Alotau on private jet charters, thus sidestepping the capital. The onboard helicopter provides access to places that would otherwise be difficult to reach — I fly in it along Tufi’s fiords with scores of hornbills below, and again over the coral dots of the Louisiade Archipelago — while the boat joins up the island dots that would otherwise only be linked by infrequent and unreliable supply ships. Tourists remain scarce but word is clearly beginning to spread among the adventurous and wealthy. When we anchor at Kanapu Island in the Lusancay archipelago, the gossip is that Mick Jagger is hanging out with the chief on the Trobriand Islands, 50 nautical miles southeast. He’s been travelling on another private boat charter. Not that the nearby presence of a Rolling Stone means anything to the Dobu fishermen of Panapompom Island — as deliciously named as Goodenough Island, which we pass in the night. This is where I do my first ever dive, over the wreck of a second world war Mitsubishi Zero aircraft that ditched during the Battle of the Coral Sea in May 1942, when this entire region was a theatre for the Pacific War. The Zero’s propeller reaches upwards like the flipper of a turtle; its broken nose is occupied by three clown fish and shoals of turquoise demoiselles. I also join a snorkelling expedition off Duke of York Island, where I swim into the turret of a Japanese tank sitting 10ft below the surface, and then later in the week, 10 nautical miles off Tufi, I float above coral gardens vast and bright, where unicorn fish lurk about the staghorns. It feels like I’m discovering the world for the first time. It was on one of these trips that Lewis captured the first photograph of a golden eagle ray in the wild. Our trips on land are no less revelatory. We hike through forest loud with birdsong, stopping to cool off in waterfalls and visit communities so remote, we are told that we are the first foreigners to have arrived for 12 months. And what a party they make of it. Each landing is marked by extravagant “sing-sings”, which the entire village attends. Drums are beaten. In their performances, locals wear talons from cut bamboo and headdresses made from cassowary feathers. Children with caramel-coloured skin and sun-torched blonde hair don crowns of orange flowers; they paint their bodies with white dots, looking like Keith Haring pictures. On New Ireland, the locals tok story (pidgin for telling a good yarn) as children sit listening in the elbows of the banyan trees. The Tufi women, with tattooed faces, thread blood-red hibiscus blooms through their ear lobes. Outriggers gather at our boat’s stern in the green fiords of Oro Province to sell pig-tusk necklaces and nautilus shells the size of skulls. On Fergusson Island, we walk among the Dei Dei hot springs where, in the 1980s, three love-struck Trobriand Islanders committed suicide by jumping into a bubbling pool. Sometimes the clear skies turn to black, with storms that eclipse the sun, the rain smudging out the volcanic cones that make up this tumultuous part of the Pacific Ring of Fire. 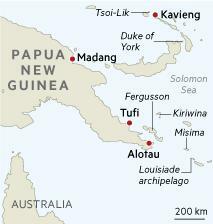 Among them is East New Britain’s Mount Tavurvur, which with Mount Vulcan, blew on September 19, 1994. Some 50,000 people were displaced, including John Rupert, a local I get talking to among a crowd in Urkuk village on Duke of York Island. I love listening to these people; there is poetry in the way they use the English language, and their powerful impulse to pin down meaning with concrete images, even if they’ve never heard a lion’s roar. Their common Tok Pisin, or pidgin tongue, is no less engaging. Branches are finga bilong tri; waterfalls are wars kalap, or “water collapsing”. We may be from opposite ends of the earth, but we can more or less communicate directly. That in the end is the privilege of this particular boat journey — not just the extraordinary landscape, nor the rush of each foray by helicopter, but the human encounters in holes in the map few others get to.